NEW DELHI (Reuters) - India will double the target for energy to be generated from solar parks by 2020, a top government official said, as roof-top installations progress slower than anticipated and U.S. company SunEdison's projects are threatened by its bankruptcy. The solar parks are sought after by companies because the Indian government acquires land for the installations and sets up transmission lines, major attractions in a country notorious for red tape and public opposition to land transfers. Debt-heavy SunEdison (SUNEQ.PK) was one of the first companies to be drawn into the programme to encourage solar use, bidding aggressively to win a 500 megawatt (MW) project in Andhra Pradesh state in India's south last November. But after its bankruptcy, SunEdison has been forced to initiate stake-sale talks with companies like Adani Group (ADEL.NS) and Finland's Fortum Oyj (FUM1V.HE) for funds, according to sources. "We are adding 25 more solar parks to create a buffer for exigencies like SunEdison," Upendra Tripathy, secretary at the Ministry of New and Renewable Energy, told Reuters on Monday. "Solar parks are a hit with companies. A lot of them are interested." Tripathy declined to name any companies. But the new generation target of 40,000 megawatts for solar parks was likely to be approved by Prime Minister Narendra Modi's cabinet in two months, he said in an interview in his office. Pashupathy Gopalan, president of SunEdison Asia Pacific - which focuses mainly on India - did not immediately respond to calls for comment. He has previously said the company would stick to its India growth plans. Analysts said it was doubtful any rival would pick up the Andhra Pradesh project at the aggressive power prices promised by SunEdison. Once the fastest growing renewable energy developer in the United States, SunEdison beat out 29 other bidders for the solar park with a record-low tariff of 4.63 rupees per kilowatt-hour. Japan's Softbank Corp (9984.T), Taiwan's Foxconn (2354.TW) and India's Bharti Enterprises have pledged to invest a total of about $20 billion in India's renewable sector. Global solar giants like First Solar Inc (FSLR.O), Trina Solar Ltd (TSL.N) and Fortum are also expanding their presence. 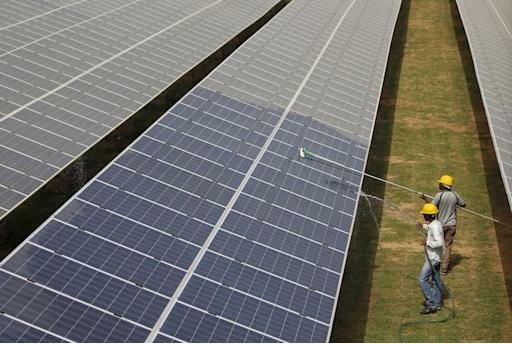 Modi wants India's solar capacity to jump nearly 30 times from 2014/15's levels to 100 gigawatts by 2020. Last month India secured a loan of more than $1 billion from the World Bank for its ambitious solar programme. Total investment needed for the solar goal is around $89 billion, according the Ministry of New and Renewable Energy. India wants renewable energy, excluding hydro-electricity, to contribute 8 percent of the energy mix by 2022, up from 5.7 percent early this year.